The SL550 is powered by Mercedes' new 4.6-liter V-8 engine with 429 hp -- a gain of 12% -- but still offers improved fuel economy. The sixth-generation Mercedes-Benz SL roadster scheduled to be unveiled next month at the Detroit auto show will have a new, all-aluminum body shell. The new SL's aluminum body shell weighs 110kg (242 pounds) less than the current car's steel construction. "The effect is as if a large passenger has stepped out of the car," Thomas Rudlaff, who has responsibility at Mercedes-Benz for the aluminum body shell, said in a statement. "Less weight means improved performance and efficiency. In other words, the driving pleasure increases and the environmental impact decreases." Because of the car's lower weight, Mercedes said it could add more high-technology assistance systems to the SL. The Magic Vision Control windshield wiper and washer channels water to the windshield just in front of the wiper blade and eliminates splash. It also makes it less likely that washer fluid will fly into the passenger compartment when the roof is down. The wiper blade is heated. To improve sound from the audio system when the top is up or down, the FrontBass system uses free spaces in the car structure ahead of the foot wells as resonance chambers for the woofer speaker system. The result is better sound, while freeing up space in the doors and interior. The 2013 SL is one of three redesigned or refreshed Mercedes models planned for 2012 introductions. The GL SUV will be redesigned and the GLK SUV will receive a midcycle refreshening next year. 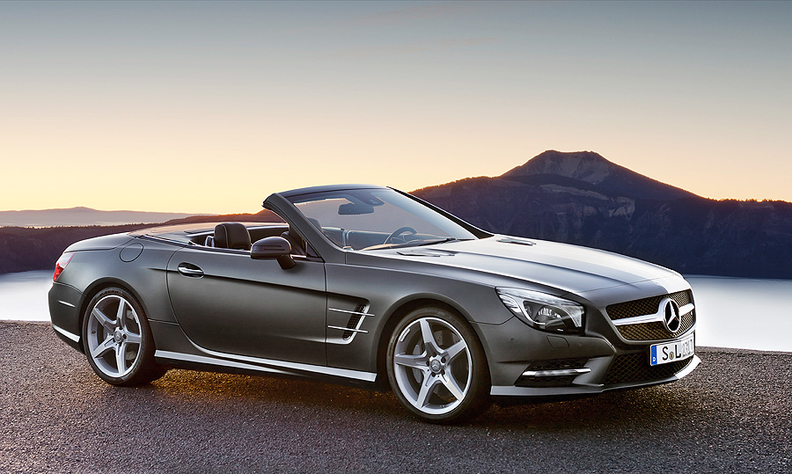 The new SL550 is powered by Mercedes' new 4.6-liter V-8 engine with 429 hp -- a gain of 12 percent. Fuel consumption has been reduced by up to 22 percent. The new SL 350 has a new V-6 engine whose displacement remains the same at 3.5-liter, but it is almost 30 percent more economical than its predecessor. Both engine variants have start-stop and a seven-speed automatic transmission. The new SL also has an agility-control suspension system as standard equipment. The active body control suspension is optional. Both are combined with a new electromechanical direct-steer speed-sensitive system that varies based on the angle of the steering wheel. It also provides better directional stability at high speeds and makes it easier to maneuver and park, Mercedes-Benz said. The SL will continue to feature a retractable hardtop available in glass or a transparent Magic Sky Control that switches between light and dark with the push of a button. Both hardtop roofs feature a magnesium frame that is 13 pounds lighter than the frame on the outgoing model. The SL also has a hands-free access system allowing the driver to open and close the trunk by moving a foot below the rear bumper. Mercedes dealers start taking orders for the new SL from December 15, priced in Germany at 93,534 euros for the SL 350 and 117,096 euros for the SL 500.